Mike Racicot kept a letter with one request should he die: "I want to be put back into the air." The 37-year-old - known as "Treehouse Mike" - died on July 26 while on a wingsuit flight in Switzerland. "We were always worried about him, but he was so good about taking care of himself," said Racicot's sister, Rachel Polite, who has spent the past few months fulfilling her brother's wishes. "Now we're taking care of him." As per his final wishes, Racicot's body was cremated and the ashes were sent to family and friends who were to take them on more adventures. A big "ash jump" was held in Squamish, B.C., in late August when more than two dozen friends jumped off a cliff. When one opened his parachute, Racicot's ashes burst forth in a giant plume. His ashes have also been spread on jumps off the Kuala Lumpur Tower in Malaysia, the massive Balinghe River Bridge in China and Trump Tower in Vancouver, among others. Another jump will take place in Mexico on New Year's Eve, and some of his ashes will be taken back to the Swiss mountain where he died. Racicot earned his "Treehouse" nickname for living off-and-on for years in a secret tree house he built on Blackcomb Mountain in Whistler, B.C. He became a journeyman carpenter, a beekeeper - you had to donate money to a local charity to get some honey - and worked for a time at Tim Hortons. 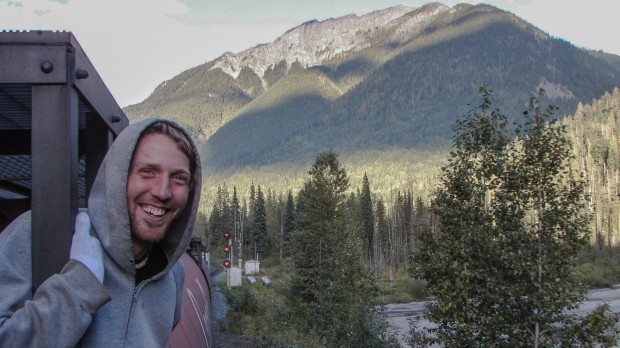 He hitchhiked across the country several times and rode freight trains for fun. That's where he started to skateboard, at age 9, because he felt more comfortable gliding then walking, said his 40-year-old sister. People made fun of his walk due to problems with the arches in his feet. "He had a little bounce in his step when he walked," said Polite, so he skated all over the small town. "He became really good, really quick." His father tried putting Racicot in football, but that didn't take. "I say to Mike, 'To be good at this, you have to hit the other guys,"' Al Racicot says. "He didn't have that in him." His adventurous spirit couldn't be contained, his family said. He jumped out of trees and soon began jumping off bridges, some 35 metres high, into the water below. "The first time I really met him he was doing flips off the roof of the community centre into the snow," said Adam Myers, his childhood friend. Together, Racicot and Myers started a graffiti collective - called DBS crew - that left their marks across the city. "If you're in Ottawa, Mike is a legend," Myers said. "All they knew is this guy started DBS, moved out west, lived in a tree fort and became a BASE jumper." "He was so stoked, you could see it in his eyes," said Myers. "He wasn't the greatest one in school," his father said, "but, boy, could he work." The scooter maxed out at 60 km/h through the flats of the Prairies and chugged uphill at 40 km/h through the Rockies, his life's belongings weighing him down. It took him a month to get to British Columbia. Drivers gave him the finger the entire ride, his sister said. But rent in Whistler, even when he lived in someone's closet, was too much. With his burgeoning carpentry skills, Racicot built a tree house on the side of a cliff, attached to trees. "He stole all the materials, the wood, the nails, everything" from construction sites in Whistler, said Myers. He then built an addition for visitors - a platform with a tent - and when Myers visited the home, he asked about the slash marks through the tarp. "Sometimes bears walk on the roof," Racicot told him. Myers slept little that week when he stayed with his friend. Racicot had friends working in the village's numerous hotels where he'd go for a shower as the maids cleaned a room, then grabbed grub from the free continental breakfast, and exercised in the gym. The tree house - as teens, Myers and Racicot had dreamed about building a treefort hotel that looked like the Ewok Village in the Star Wars movie "Return of the Jedi" - became synonymous with Racicot. About 10 years ago, Racicot got into BASE jumping, which involves jumping with a parachute off buildings, cliffs, or bridges. He moved to Squamish, considered by many to be among the most important areas for BASE jumping in Canada, where he'd often start his day with a jump off the Stawamus Chief, a mountain 700 metres above Howe Sound where BASE jumping is legal. "He was the chief of the Chief," said Philip Moessinger, a jumper who also learned under the tutelage of Racicot. "Everyone knows Treehouse in B.C." "You're literally flying," said Moessinger. "The feeling you get out of it, the joy, the high, is unbelievable. Treehouse felt that too." "He did it all, and did it all well and that made him impressive and unique among his peers," says Joe Putrino, who works for Apex BASE, a parachute company that sponsored Racicot. On July 26, Moessinger and Racicot stood at the top of Chaserrugg mountain with the Swiss town of Walenstadt sitting below. The sun shone down that afternoon as wispy clouds rolled by. The pair had just jumped off the mountain that morning and were back up to fly another line in their wingsuits - Racicot's suit bearing a giant image of his dog, Taco, on the front. They planned to soon meet three other friends from Canada for a jumping tour around Europe. "It was a great flight," Moessinger said. They came out of the flight line, the exit named "Fatal Attraction" where the terrain drops off, and the point at which they would fly toward the landing area where they would pull their parachutes. Racicot didn't pull his parachute. "He just disappeared in the trees," Moessinger said as he fell silent. His death has left a void in the jumping community around the world and with his family in Ottawa. His father, a devout Baptist, struggles with his son's loss. Prayer usually helps, but it didn't that first night without his boy. "The most difficult time I had was the night I heard Mike had died," his father said through tears. "I believe that we pray for people while they're alive and we make our decisions while we live. That night, as I was going through the names of our family members and friends and got to Mike, I realized I didn't have to pray for him anymore."